Only two more months and my friend and I will be winging our way to England. We’re trying hard not to be excited. Not yet. There’s too much planning to do before we lean back, take a sip of tea, sigh, and allow ourselves to dream of actually being there. I’m a total Anglophile. I love England. English food. English tea. English television. English literature. And in particular English (or Scottish or Irish) crime fiction. I’ve been to England twice. Once to London with three girlfriends on our March Break in 2000, and once with Hubby to northern England and Scotland in the summer of 2005. 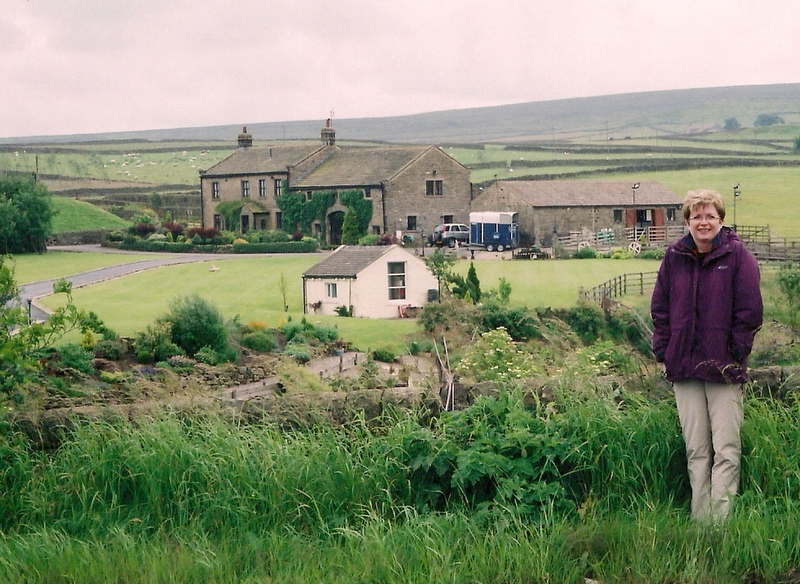 This is Hubby’s shot of me on our first day in Yorkshire in 2005. I was giddy with excitement. “Look,” I said, “a stone farmhouse, with a stone barn, and stone fences. Better stop and take a picture. We might not see anything like this again.” Ha. If you’ve ever been to Yorkshire, you’ll laugh at that. We saw more stone fences than we could shake a stick at. And we loved them all. I look excited to be in Yorkshire, don’t you think? Our first stop was the village of Haworth. Home of the Bronté sisters. 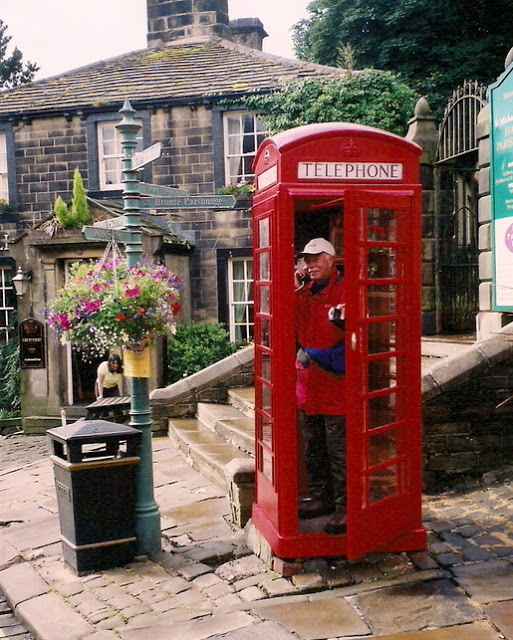 That’s Hubby in the phone box below. As you can tell from his attire, we’d arrived in pouring rain and wind. But with our trusty Gortex jackets and pants, we didn’t let a little weather stop us. He strolled the town while I worshiped at the Bronté Parsonage Museum. The dress belonging to Charlotte Bronté made me cry; it was so very tiny. Hubby just rolled his eyes when I told him. Sometimes I think it must be hard to be married to an English teacher. We both loved the town of Whitby, in North Yorkshire. Reginald Hill frequently used Whitby as a setting in his Daziel and Pascoe novels. 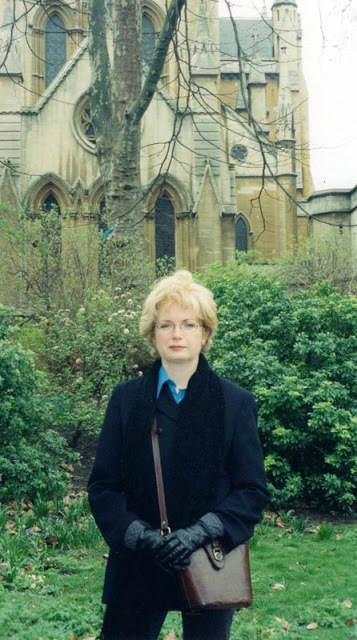 Hill is perhaps my favourite mystery writer; both Hubby and I were bereft when he died in 2012. 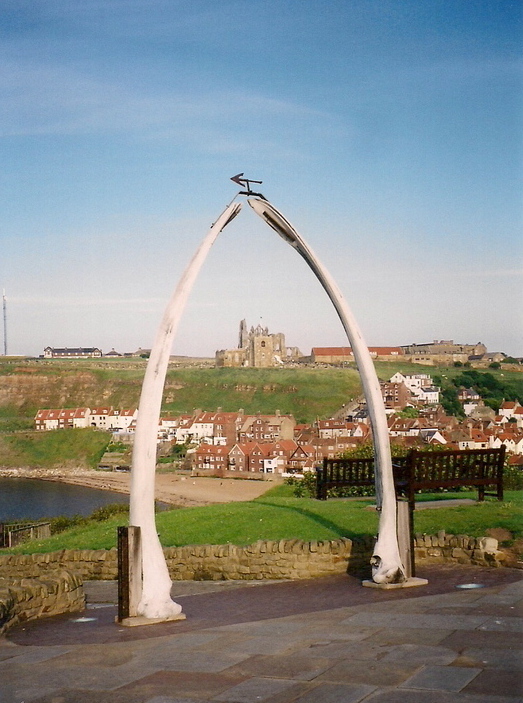 That’s the famous whale bone arch, on the West Cliff of Whitby below. You can see the old abbey across the way and, leading up to it, the ninety-nine steps which feature so strongly in Bram Stoker’s Dracula. A.S. Byatt set her wonderful novel Possession: A Romance in Whitby. I could go on, but I won’t. Whitby has a rich literary heritage, and great fish and chips as well. In fact, for the size and population of Yorkshire, there seem to be a ton of fictional murders there. I found this interesting article exploring the plethora of writers who set their crime novels in Yorkshire, including Reginald Hill and Peter Robinson. Hubby and I love English television too. And we couldn’t be in Yorkshire and not visit Goathland, the setting for the Heartbeat series which we’d been watching faithfully for so many years. 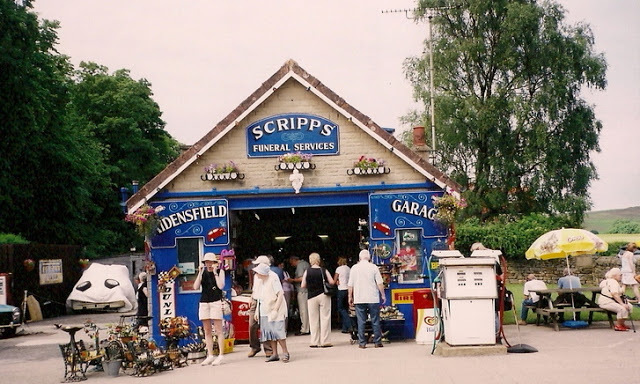 Bernie Scripps may be a fictional character, but his garage and funeral parlour exist. And the Aidensfield Arms does too, except it’s called the Goathland Hotel. We had a pint there, along with all the other Heartbeat fans. I know, the place is a total tourist trap, but it’s a charming tourist trap. I think I’m cleaning my glasses in this shot Hubby took of Bernie Scripps’ garage. So, yeah, I’m a little excited about our trip in October. But I’m trying to stay focused on the planning, not the dreaming, at this point. And planning is my passion, as you may already know. We’ve been very organized. First we brainstormed for places we wanted to see. London and Bath were top of my list. Then we met for lunch and looked at possible timelines for the trip. We knew we wanted to be away for about two weeks, but how might we divide up that time? Three days here, and four days there, kind of thing. We then decided what needed to be done in what order. And who would do what. And we gave ourselves a ballpark date for our next meeting, so we could compare notes and decide on next steps. These are some of my planning notes below. Planning notes early in the process. Based on Hubby’s and my problems with planning our South America trip, my friend and I were careful to make sure everything we wanted to do was doable, when we wanted to do it. For our South America trip, Hubby and I made a calendar of when we would be where, but then we had to change everything around due to the difficulty of making one air connection. Thank goodness we decided to book that complicated flight first. Ironically, that’s the flight we almost missed because we were locked out of our hotel, and locked in the courtyard, while the taxi to take us to the airport idled in the street. Ha. I’m smiling as I think of that night. You can read about it here, if you haven’t already. We had initially planned to go to England in September, but decided to move the trip to October. That way we could avoid the huge crowds that would no doubt be in Bath for the Jane Austen Festival. I love Jane Austen, but in a crowd of hundreds of true devotees, all decked out in Regency dress… maybe not so much. Although I must say that the event dubbed “Rummaging Through the Reticule” does have me intrigued. My first planning job was to check out airfare costs, look at rail tickets and passes, and research how best to get to where we wanted to go. Meanwhile my friend focused on London accommodation, a big job in itself. She sent me short lists, tried to make bookings, and sent me more short lists. Then once we had booked our London hotel, I booked the air flights, and purchased our rail passes. I researched and booked accommodation in Bath, and she did the same for Eastbourne. We changed our trip itinerary again this week. 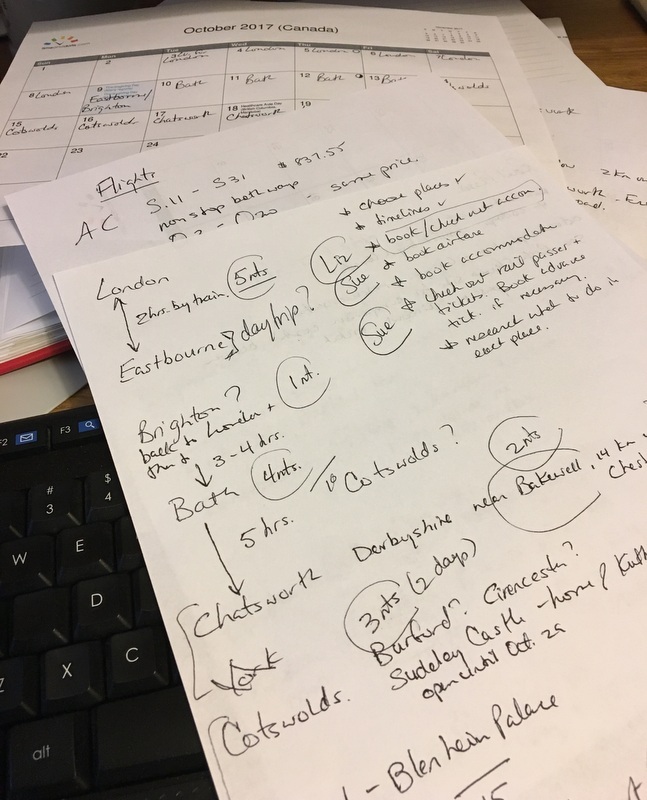 Based on suggestions made in the comments of a previous post, information in helpful e-mails from Rosie who reads this blog, and ideas from an old friend with whom I had lunch this week… we’ve decided to jettison our plans to stay in the Cotswolds. Small villages and the surrounding countryside are so much more accessible if one rents a car. But neither of us is confident driving on the “wrong” side of the road, not to mention navigating a roundabout on the left side of the road, while steering from the right side of the car. Plus, piloting a right-hand drive vehicle, makes me nauseated. Really. It’s the weird feeling I get when I look in the rear view mirror, which seems in the wrong place, and makes everything feel backwards. Add to that my current issues with vertigo, and one can only imagine the potential disasters. So, nope, not happening. That said, we’ve decided to take Sue’s advice and book a one-day bus tour out of Bath to see at least some of the Cotswolds. Then we’ll move on from Bath to Stratford. Stratford. One former English teacher, one former editor, both book nerds, what could we possibly find to do there, I wonder? And after Stratford, we’re going to Derbyshire. And Chatsworth, home of the Duke of Devonshire, son of Deborah, the late Dowager Duchess of Devonshire, who was the youngest Mitford sister. You can read about Debo here. Oh my, I am so looking forward to finally seeing Chatsworth. I mean, given my obsession with all things Mitford. I’ve read two of Deborah Devonshire’s books, several biographies of one Mitford sister or another, not to mention Nancy Mitford’s novels. Let’s just say that on top of being an Anglophile, I’m a raging Mitford-phile. This is me, below, in London, in March 2000. While the other ladies set off one morning to see the Tower of London and Saint Paul’s Cathedral, my one friend and I strolled around Bloomsbury. Imagining life in the early twentieth century. Gawking at Gordon Square where Virginia Woolfe lived and where the Bloomsbury Group began. I look kind of smug, don’t I? I’m wearing my favourite (at the time) Max Mara blazer. By the way, Dottoressa, who reads this blog, says that Max Mara is much more reasonably priced in the UK. Hmmm. So, we’re about halfway through booking everything for our trip. But it hasn’t been all smooth sailing. We panicked a bit when we had trouble finding a suitable hotel in London. Then I had challenges booking our rail passes on-line with Brit Rail. Well, actually with their vendor, and my credit card, and getting kicked off the site, and trying again. Four times. And after two phone calls to MasterCard, and one very long one to the Brit Rail vendor, I finally straightened out the fact that I wanted to purchase two tickets…. not two tickets four times. I tell you, I nearly had a heart attack when, after I received my confirmation of purchase, I checked on-line and saw that I had been charged four times. Technology is not always our friend, people. And after the booking is done. We’ll have more reading to do. About what we might get up to in each place, which plays we want to see in London. Maybe even where we might want to shop. That kind of stuff. And then. Then it will be time to get excited. And to dream that we’re actually there. At least for a while. Then the outfit planning will start. Sigh. And that’s the very best kind of planning. What about you, my friends. How do you go about planning a trip? Hi Sue, your plans for England sound wonderful! When we go to Europe we are often visiting friends, so that dictates where and when we go. Otherwise I just spend A LOT of time online, checking out travel blogs etc. I think that your careers have certainly given you and your friend a structure to work on – the trip is almost planning itself! :0) Good luck with adding the finishing touches. I must say, I'll be interested to learn where you stay in London, hopefully it's somewhere reasonable. Thanks, Patricia. We're staying at a place called the Fielding Hotel in London. Recommended by friends who have stayed there several times, and also recommended in a travel article in the Telegraph, we decided to overlook a couple of iffy ratings on Trip Advisor and go for it. Fingers are crossed. It was funny to see all those familiar Yorkshire places this morning & a little odd to see you describing our dry stone walls as 'stone fences' . I had an old uncle who was a dry stone waller in Nidderdale . He smoked a pipe & measured his progress on the wall by the amount of tobacco he smoked – he didn't own a watch . After an ounce , he had done his days work . He lived to a very good age too , despite the pipe . Oops…I forgot that they are called walls and not fences. Here our historic stone fences are usually built by piling rock on the edge of a recently cleared field, then adding a cedar rail fence on top. As a teenager we helped my stepfather "pick rock" on recently cleared land meant for pasture. Didn't make it into a stone fence though. And over the years when we're fishing, Stu and I have come upon old stone fences in the bush on abandoned farms. I always exclaim over the work that was needed to clear the fields, remove stumps, pick rocks etc and then have them return to their natural state generations later. My trip this time will be the antithesis of what Stu and I usually do. No driving. And not many tiny quirky villages. But the literary landmarks will make up for that, I hope. I would love to meet up if we can. We just made our reservations for Chatsworth this morning. We're staying on the estate at the Devonshire Arms on October 16 and 17, then we have one night (18th) yet to be determined before we head back to London. We're trying to decide what to do about that. I thought maybe somewhere within easy reach of Chastworth, and yet easily accessible to rail to get back to London on the 19th. Any suggestions? I'm afraid , as a true northerner , I rarely head south & it is ' foreign parts ' to me . So I'm not really the one to make suggestions for your spare day . As an apology , you might like this obituary for Debo. Like you , I seem to have been reading about the Mitfords for years & find them fascinating , though I think they were probably pretty terrifying ' in the flesh ' . Perhaps your Cotswold tour will include Swinbrook & the graveyard there . Thanks, Wendy. I will see if any of the day tours go to Swinbrook. Wouldn't that be interesting? Thanks, Iris. I think that Robinson's series gets better. I can't remember the early books, but I just skimmed through an early Reginald Hill when I was writing this post, and it's not nearly as erudite and witty as his later ones when the characters are much more fully developed. Maybe it's the same for Robinson. P.S. Got a kick out of your having visited Whitby – my mother's hometown. Last time I was there was on Halloween and I did not know it was also Goth Day, when the entire town was overrun with goths in full gear – that was quite the experience! Oh gosh. That will be right up my street! Thanks, Heather! When you go to Chatsworth, will you see it as Pemberley? Or is that theory exploded now? Apparently, a turn in the drive reveals the house "situated on the opposite side of the valley" as described in P&P. When I was a student, teaching EFL in Oxford in the summer holiday, another teacher and I volunteered to take students on a coach trip to Bath and Cotswolds. Imagine our dismay when the coach driver explained he did not do a guided tour; we would have to provide the commentary ourselves. Long before phones and google; we had an ordnance survey map and a guidebook. Fortunately, we had not managed to teach them much English, so they remained mostly unaware of the rubbish we were talking. The only laugh I got was when we rolled into Bourton on the Water and I told them it was "the Venice of the Cotswolds". You ARE an Anglophile! I'm impressed with everything you've read and the places you're more than familiar with. I'm going to Italy next month and understand what you mean about online booking and winding up with more reservations than you intended. My girlfriend and I haven't allowed ourselves to get too excited, yet, either. Too much to do! Ah… Italy. Save up all your adventures and then tell us on your blog. Stu and I are hoping to go next year. I need to start researching. I am so excited for you! My daughter and I recently returned from 2 weeks in England. We stayed exclusively in airbnb homes. Our digs in Bath and Bakewell were wonderful if you need recommendations. Coming from the states we were enthralled with the history. And Bath was an unexpected gem! Thanks, Kim. We've already booked Bath and Chatsworth, though. But good to have another positive story for Air B&B….we haven't tried booking with them yet. My plans are always very precise (Google maps-thank you! ),I pick a thing or two for a day and than leave enough time for coffee,tea,lunch,people watching,sitting in the park…. You are my kind of traveller, Dottoressa. I don't like to cram too many things into a single day. Good to have the tea and coffee recommendations. They will factor largely into our days, I know. I am excited for you! In 2014 I went on a literary tour of England, organized through a bookstore in Kansas City (I used to work at Rainy Day Books and I knew it would be exactly what I wanted), planned with a few meetings (tea!) with local British authors and geared to classic locales. We saw London, Bath, the Cotswolds, Stratford-upon-Avon, Oxford, and Hay on Wye in Wales. For an anglophile (British history major, British literature minor) it was 11 days of pure heaven. My favorite stop on the tour was Sudeley Castle, with Blenheim Palace being second. Although to say that makes me feel like having to choose my favorite child – impossible. For my free time in Bath, I went to the Fashion Museum of Bath which is located in the former Assembly Rooms that we have read about so much, and that was my favorite thing I/we did there (although of course the Roman Baths were spectacular). Here is a link: https://www.fashionmuseum.co.uk/visit By the way, you should see about buying the Museums Saver ticket, or one of the other package tickets, depending on your interests. I loved this post for the opportunity to reminisce. Thank you so much. Sudeley Castle was on my list but I'm not sure of we;ll get there. The Fashion Museum is top of my list. I will bookmark that link…thanks. Sudeley is not so much an impressive place, it's more a warm, inviting look at a historical home. In fact it is a home that is open to the public. There is a quiet beauty to it and much history. When I was there, they let us peep out of the sewing room window to look down at the knot garden below. The garden is wonderful to look at from the ground, but much more evocative from above. I forgot until I saw another blog post, that the best thing in London was going to the Royal Mews (around the corner from Buckingham Palace) and also the Horse Guards. Those were things I did apart from the tour and were necessary from the horse woman standpoint. I shouldn't forget the National Gallery or the National Portrait Gallery either. It's all overwhelming unless you take it in pieces, just as you seem to be doing. We'll all be waiting to see everything through your eyes. So glad you found a hotel to suit — and Karen above says her sister loved it–it's always a good idea to ignore some of those posts on TripAdvisor, or at least take them with a big grain of salt. I find a regular sample of posters who expect luxury accommodation at prices that don't match, and then complain about what's missing instead of noticing the good. And you're in a very good location for getting to shows and galleries and shopping! And I should have known (did I already?) that you, too, are a Reginald Hill fan. His death was such a loss, as he took with him Dalziel and Pascoe, a host of wonderful minor characters, Wieldy being perhaps my very favourite… One of these days, I swear I'm going to sequester myself for a few weeks and read myself right through the series again, start to finish. . .
Oh… I love Wieldy too. I always found that the actor who played him in the TV series was exactly as I had pictured him, taciturn, but good humoured. I found a website when I was writing this post yesterday that examines a couple of Hill's books for allusions and references to Jane Austen. I may go back and reread those books. Hill's books are always so clever. My favourite was the one where Elly was writing a book about Odysseus and she kept hearing her main character speak in Dalziel's voice. Mr. Collins was indeed perfection. Just this week I finished a Reginald Hill D&P novel that I had missed when it came out. very blissful (although I didn't care for the earliest ones when THEY came out….) and resolved to read through the entire series in order one of these days. And second the urging to get to Chatsworth when the family fashion exhibit is still open, it looks delightful. As a Mitford fan, I hope you have read the various collections of letters between the sisters? Talk about a dead or dying art form, but wonderful reading, those letters. I didn't like them at first either… then I grew to love the characters. I haven't read any of the compilations of letters between the sisters. Maybe I should try to get some from the library before I go. I'm saving Cornwall for when my husband and I can go together. He'd love it there. Great to see your pictures of Goathland and Whitby …The North Yorkshire Moors is one of my favourite places especially Goathland and Rosedale. I remember visiting Haworth with my mum in my teens …bought a much loved midi dress from a local boutique! Thanks, Rosie. I'll be in touch with our final itinerary soon. As a Brit now a Canadian living in BC this post brought back lots of memories. I have been returning to the UK once a year for many years but it is always to visit family so don't get many opportunities to do sightseeing. You are so organized with your planning that you will have a fabulous time. Just a thought if you are interested in seeing shows while in London you can sometimes pick up cheaper tickets last minute. Covent Garden used to have a ticket place where you could get these but if you want to see some of the main musicals then these need to be booked well in advance. I have seen some super plays doing it this way. Thanks, that's good advice. We did that in New York last year. Just bought the day before we wanted to attend. Thanks, Lydia. We'll be there in October, though. I enjoyed my first-ever trip to England in 2015, and can hardly wait to return someday. We have a niece who lives in Sheffield with her husband and adorable two-year-old, so we always have them as an excuse to return! I am totally with you on Reginald Hill. I felt as if I had lost a friend when he died … many friends if you include the cast of wonderful characters who will never be part of a new story. I have read his whole series more than once, but recently started again at the beginning, this time on audiobook. Such fun to hear them narrated by a good reader! We ended up having a chance to make a quick visit to Edinburgh as well during that trip, and I enjoyed seeing places in person that I had previously only encountered via Ian Rankin's wonderful Rebus series. I may follow your example, Denise. Start listening to old Reginald Hill books on my i-pod. Like visiting with old friends. And if the narrator is good… a different experience from reading, too. Sounds like a wonderful trip and congratulations on doing all that planning. Booking things online always seems so simple but often isn't !! Autumn is a lovely time to come here as we often have an Indian summer and it's relatively dry(for England ). Good advice, Carol. Like choosing a good roommate… not all friends make good travel companions. But Elizabeth and I shared a house when we were single; we're pretty used to each other's idiosyncrasies. I feel lucky since living in Europe makes the UK so much more accessible. And we do take advantage of that. Whitby, I loved as well. It´s such a dramatic setting. All of Yorkshire, actually. Bath is lovely, too. If you can include Brighton, do. Being in Eastbourne, that should be easy by train. Around the pier, it has this, well, tatty genteel seaside town vibe while in town, in the North Laines you have these incredible independent shops with a vintage feel. Oh, and there´s this wonderful vegetarian restaurant called "Food for Friends". Amazing food, amazing cocktails. Sigh. Can you tell I love Brighton? If you have an afternoon in London left with no plans (ha! as if! ), go to Spitalfields (tube: Liverpool Street station). The market is good if touristy, Brick Lane a stone´s throw away and, best of all, go to Denis Severs´ house if you happen to be there on the days they´re open. It is a unique experience and unlike any museum. I´m not a museum nut myself, but thouroughly enjoyed it there. We were lucky to be able to attend a Regency era-style tea party in the very house held by the food blogger Mrs Marmite Lover. Oh, it was amazing. I guess my holiday planning is a lot like yours and the work of planning is part of the fun, really. So much great information, here, Ines. Thanks. I follow a blog that is about Spitalfields… thanks for reminding. It's just the kind of interesting place I love. I'm definitely going to put hat on our London list. Thanks. Oh, I forgot: I can recommend as well doing a food walking tour. You wiil walk with your guide through an area and stop at different venues to taste all kinds of drink and food while learning about the area and its history. Delicious! I love England too. I have been exploring it a lot the last few years and have been surprised by all the cute towns outside of London. I have not been to the Cotswolds yet so looking forward to reading about your visit. Last year I went to the Lake District and absolutely loved it. Thanks for sharing on #TheWeeklyPostcard. We will only be doing a day trip to the Cotswolds. I'm sad we couldn't make that happen, but hopefully other things will make up for it. I'm so interested in your trip to Chatsworth. How you get there and do you stay over night. Please publish you plans when you have then figured out.. Thanks. I will let you know, Sandra. Sooo looking forward to Chatsworth! Wow, what a fun, fun post and sweet, informational comments from so many. As an American, I haven't traveled outside London since (really hate to admit this — deep breath!) 1967. I've been to London several times since then (usually just passing through on the way to other wonderful places in the world), but I must get back to England-England. I was just online looking for literary tours and happy to see that there are quite a few. My sisters and I have also considered a walking holiday in the Lakes District. We have two sets of friends who have done walking tours in the Peake District, near Chatsworth, where we'll be going. We won't be walking, though. I'll save that trip for going with my husband. He and I didn't have time to visit the Lake District when we went to Yorkshire in 2005, although it was on our list of "possibles"…had to choose between the Yorkshire moors or the Lake District. As we often say… we can't see everything! My daughter is in Southampton and I envy you this trip! I visited her and we did a bit of travel, but she also posts the most amazing pics of the New Forest, the Jurassic Coast, etc. We're hoping to do Italy next year. Maybe. I've never been. How fun! I envy you having a friend to share the planning with. When hubby and I travel, I do pretty much all the planning. I love it, but sometimes it can be quite overwhelming.